This week the Festival of Free Bets has returned to Sky Casino and it gives all members of the casino the chance to receive loads of bonus cash. 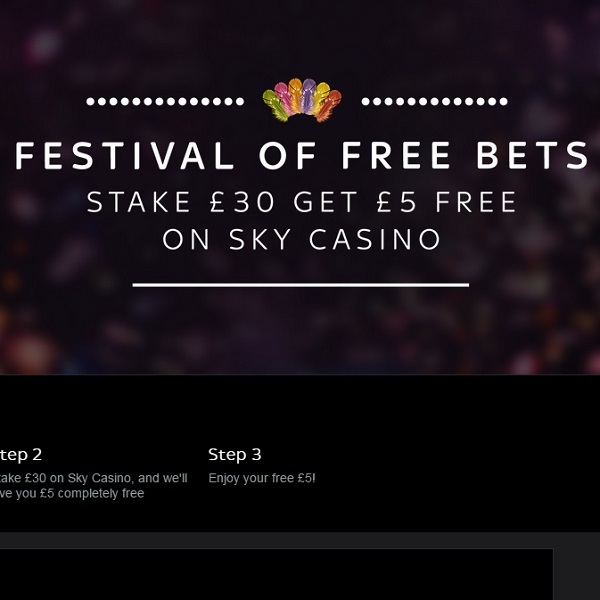 The promotion is extremely simple, simply opt in to the promotion and bet £30 on any Sky Casino game and you’ll receive £5 free to place a bet with. The promotion is running until the 17th of May and there is no reason that players can’t receive multiple free bets. Players can also combine this with the £100,000 Playoffs. Opt into this promotion and start playing games to collect comp points. At the end of round 1 the top 200 will receive a bonus and progress to the next round. This round there is a top prize of £5,000 up for grabs so keep playing for your chance of receiving some huge payouts.